Sears, the US department store chain, will stop selling most Whirlpool appliances following a dispute over pricing. The move ends a sales partnership that started more than a century ago. Sears Holdings, which also owns Kmart, said it could not agree new terms on pricing with the world's biggest whitegoods manufacturer. The move affects popular US brands including Maytag and KitchenAid. Whirlpool chief executive Marc Bitzer dismissed the move, saying Sears accounted for only about 3% of sales. 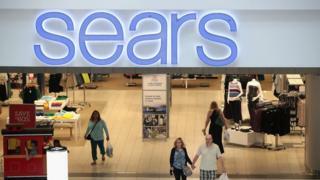 However, its shares fell more than 10% in afternoon trading in New York, while Sears shed more than 3%. After starting as a mail-order catalogue before growing into a leading department store chain, Sears has closed hundreds of stores in recent years as shoppers increasing buy online. This spring, it said years of losses cast doubt on its future as a going concern. It later took legal action against suppliers that sought to change contracts in the wake of the store closures. Sears Holdings informed staff of the decision to stop carrying Whirlpool products in a memo last week. The letter, which Sears released on Tuesday, said Whirlpool had made demands that would have stopped it offering products "at a reasonable price". The two companies had worked together since 1916, collaborating to develop and market new products such as the first automatic washer, according to the Wall Street Journal, which first reported the change. Mr Bitzer did not share details of the pricing dispute in a call with analysts. But Whirlpool has warned investors about pressure from lower priced competitors, warning that profits had fallen more than 11% this year due to pressures in markets including China and Latin America. In the US, the company has also sought redress from the US International Trade Commission over imports of washing machines from Samsung and LG that it says have harmed its business. The retailer said it would continue to sell the Kenmore brand, which is made by Whirlpool. In an attempt to boost sales, Sears said this summer it would also sell Kenmore products on Amazon.